He’s racked up 50,000 miles on his recumbent trike, enough to go twice around the earth but this is not a typical tale of an adventurer, pedaling through far off lands in the prime of youth. This is the story of someone who didn’t start cycling until he was in his 50s and diagnosed with Parkinsons Disease. His name is Jim Wetherell or “Parky” to his friends. For us, he just might be the most inspiring cyclist we’ve come across yet. On his appropriately named website – I Never Give Up – we learned more about Parky. His story started in 1995, when he noticed a quiver in his hands. Doctors diagnosed Parkinsons Disease and, for a while, life looked bleak. Parky’s marriage broke down. He became depressed. He needed something to focus on. That something, turned out to be cycling. Over the next 14 years, Parky rode his trike as much as possible. He overcame tremors, bladder problems and fatigue along the way, all brought on by Parkinsons Disease. His achievements include a 500 mile trip through California and the 2006 RAGBRAI tour across Iowa. In May of 2009, Parky reached his goal of cycling 50,000 miles. Describing his first long trip, Parky offered some wise words for any touring cyclist. 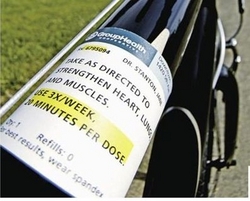 A sticker on his trike, made to look like a prescription label, also says a lot about Parky’s love of cycling.